Art #18 LAHORI DULL: Volley Ball from locally made material. Butyl Bladder, laminated with 1-cotton layer and 1-polyester layer vulcanized backing. Has all the specification for a game ball. However, normally used as promotion purpose. Available in size 5. These designs are just for reference and we do not keep steady stocks. We welcome your custom designs. 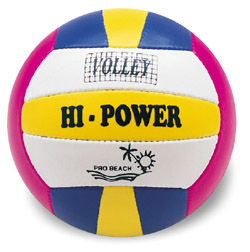 Volley Ball from locally made material. Butyl Bladder, laminated with 1-cotton layer and 1-polyester layer vulcanized backing. Has all the specification for a game ball. However, normally used as promotion purpose. Available in size 5.